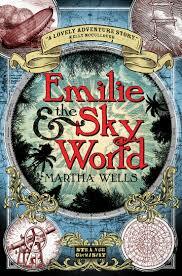 I am not a huge fan of Science Fiction, which is what Emilie & The Sky World is. However, this was an Advance Reader Copy (thank you NetGalley!) and I felt compelled to read it. This book is interesting because the story takes one to different settings, but it can be a little difficult to follow because there are a lot of characters. Emilie has just returned form her adventure and is ready to take some time off. However, when she goes to her boss’s house to pay a visit, her boss shows her that a type of vortex called an aether has opened in space. An aether opens the world to a parallel universe but can close at any time and trap the people out of their own universe. Emilie and her friend Daniel attempt to go through the aether and make it through. The first few times someone has tried this, the airship has never returned, so for mankind, this is amazing progress. Emilie finds herself in the middle of a place unknown to mankind with nobody around her except for the flower creature who is injured. The aether is going to close soon, and Emilie needs to find her way back, and soon. Emilie names the flower creature, who is unable to speak English, Hyacinth, and the two of them go on an amazing journey to get back home.Will Emilie be able to make it back to the airship, help Hyacinth, and find her friends in time before the aether closes?